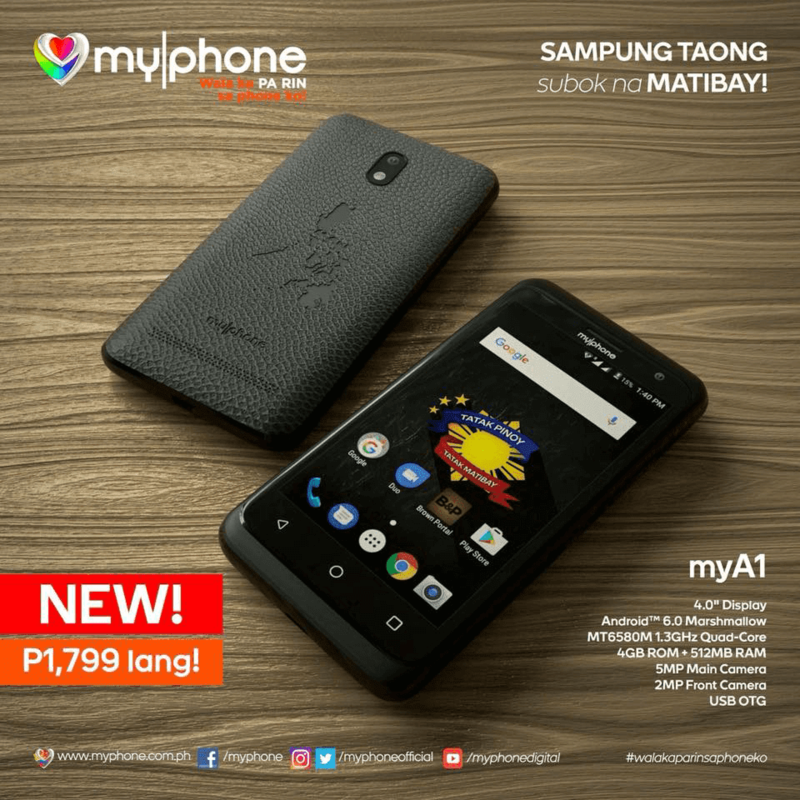 MyPhone launches 7 new budget smartphones, all priced under PHP 3.5K! Home / mobile / myphone / news / MyPhone launches 7 new budget smartphones, all priced under PHP 3.5K! Aside from the MyPhone MyA10 with "dual cameras", the pioneer local mobile brand just launched a total of 7 (seven) other budget Android powered smartphones. 1. MyPhone MyA1 - For PHP 1,799, it features a 4-inch screen, 1.3GHz MT6580M quad-core processor, 512MB RAM, 4GB ROM, 5MP main camera, 2MP selfie camera, USB OTG, and Android 6.0 Marshmallow OS. 2. MyPhone MyA2 - For PHP 1,899, the MyA2 also boasts a 4-inch display with 1.3GHz MT6580M quad-core processor, 512MB RAM, 4GB ROM, 5MP camera, 2MP selfie camera, USB OTG, and Android 6.0 Marshmallow OS. 3. MyPhone MyA3 - Priced at PHP 1,999, the MyA3 arrived with a 4-inch AMOLED screen. Inside, it has a 1.2GHz quad-core processor, 512MB RAM, 4GB ROM, 5MP main camera, 2MP selfie camera, USB OTG, and Android 6.0 Marshmallow OS. 4. 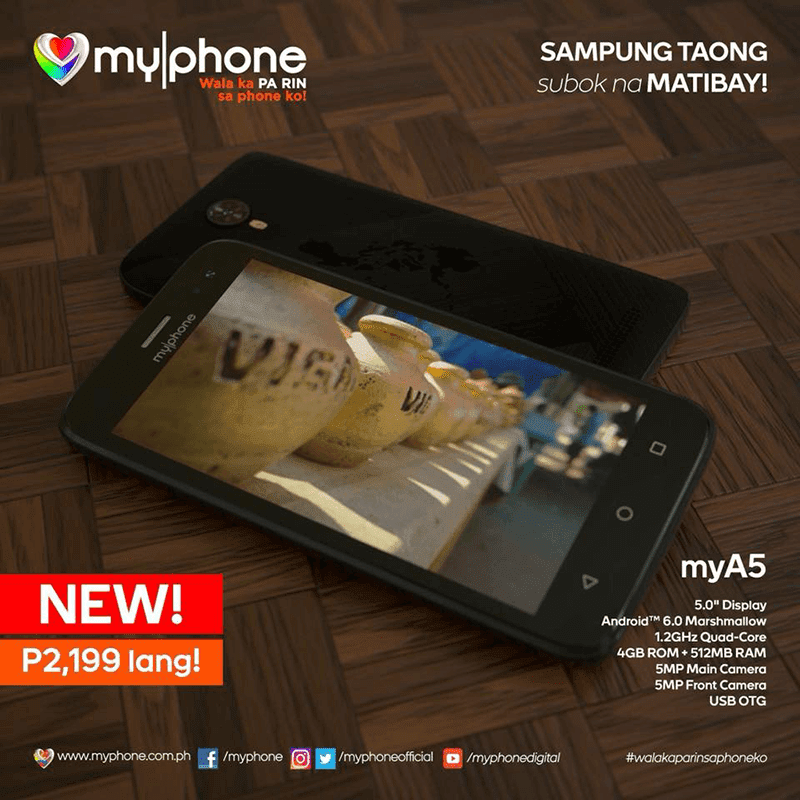 MyPhone MyA5 - For PHP 2,199, the MyPhone MyA5 features a bigger 5-inch screen. It has a 1.2GHz quad-core processor, 512MB RAM, 4GB ROM, 5MP main camera, 2MP selfie camera, USB OTG, and Android 6.0 Marshmallow OS. 5. MyPhone MyA6 DTV - For just PHP 2,399, the MyPhone MyA6 DTV will give you a decently sized 5-inch display with 1.2GHz quad-core processor inside. It still just have 512MB RAM and 4GB ROM. On the camera part, it has a pair of 5MP back and front cameras. It highlights a Full Seg Digital TV. This phone still boots with Android 6.0 Marshmallow OS. 6. MyPhone MyA7 DTV - For PHP 2,899, it has a 5-inch FWVGA screen, 1.2GHz quad-core processor, 1GB RAM, 8GB ROM, 5MP main shooter, 5MP selfie snapper, Full Seg Digital TV, and Android 7.0 Nougat OS. 7. MyPhone MyA9 DTV - For PHP 3,399, the MyA9 has a 5-inch HD IPS screen, 1.3GHz MT6580A quad-core processor, 1GB RAM, 8GB ROM, 3,500mAh battery, 8MP main camera w/ AF, 5MP selfie camera, and Full Seg Digital TV.